I have two cars; a VW GTI 1.8T turbo powered mad machine which can get 35 MPG if I drive like grandma, and my Honda Insight which can get 100MPG if I draft behind a semi truck from driveway to parking space and back again. I caught this shaky image on my way to work today in my Honda Insight as the speed was changing from 65 MPH to 64 MPH. Every original Insight that ever rolled off the line is a hand built MPG machine. The entire thing is designed and built to maximize miles per gallon… the whole car is built from aluminum, it’s completely streamlined, etc. But the one feature of this car that gets me the most MPG is the real time MPG gauge. By giving me immediate feedback, I know right away how my poor driving habits affect my MPG average. Many cars throughout the years have had MPG gauges. But those gauges have, for the most part, always shown your MPG average. There is no immediate feedback, and that’s what counts when it comes to behavioral game theory. I like to go fast. When I was a kid I raced dirt bikes through the wooded area behind my parents’ house. I took my first car through a fence because I wanted to see how fast I could take a 90 degree corner (not that fast it turns out). When I bought my trusty little Chevy Metro (Geo Metro for the die hards), I ran that little 3 cyl 1.0L engine to the breaking point… but then I bought my GTI. I installed the cold air intake, boost controller, radar detector, and IR laser jammer (which is still legal btw). Every morning when I drive the GTI and turn on to the freeway entrance ramp, I gun it to see if I can beat whatever car was already barreling down the freeway and at least half way past the entrance ramp. 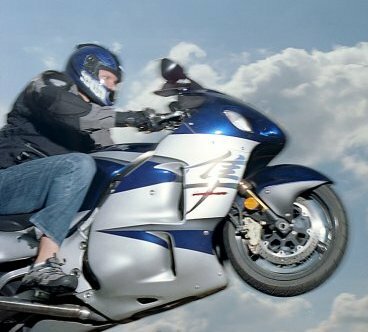 Even though its possible to take my trusty GTI up to 140MPH+ (like I did on the test drive), I bought my Hayabusa so I could go even faster (and it does). After driving the Insight to work only a few days, I quickly realized that I every morning I’d been gaming. When driving the GTI or the ‘busa, the game was “see how quickly I can get to work”. The focus was entirely on maneuvering, speed, watching for speed traps, etc. It didn’t matter if I was early or late, or the amount or work or project importance waiting for me when I got there, the focus was just “get there”. When driving the Insight, the real time MPG gauge gives the immediate feedback required to make it a game to my subconscious. An action like passing someone in my GTI or seeing the RTMPG (real time MPG) gauge glide up to 110MPG as I close in on a semi truck’s bumper illicit the immediate gratification required in game play. The knowledge that your decision and subsequent action has paid off furthers your interest in continuing the game. What I’m saying here is that, without even being that conscious of it, the real time MPG gauge changed my entire game, and my driving habits. Even though it looks like I’m still a mad man on the road (just a different kind of mad man), the point I’m trying to make here is that I believe by simply including a real time and average MPG gauge in every car and truck, in a prominent location like it is in the Insight, the national average MPG could be drastically raised… just by giving drivers more information and direct, immediate feedback. I also think it would do more to curb speeding and educate drivers than all the speed traps in the world combined. I know if I had these gauges in my GTI, it would definitely change the way I drove that car. One thing’s for sure, it’s definitely less stressful driving the Insight, especially when the game’s success = less visits to the gas pump and more money in my pocket. This entry was posted on Thursday, August 20th, 2009 at 10:26 am	and is filed under Life in general. You can follow any responses to this entry through the RSS 2.0 feed. You can leave a response, or trackback from your own site. If I drive my GTI when I’m in “game mode”, I get far worse than the 35 MPG I can get if I drive it like granny… what that MPG is I actually don’t know, which I guess is part of the point I’m trying to make about the affects of gaming on behavior. I don’t know what the MPG is of the GTI when I’m racing to work because that’s not part of the game.. hence I don’t care (at least not in the moment). By including a real time MPG meter in my GTI, the game would likely subconciously shift from “go fast” to “get high MPG score”. My concious mind tends to work only with what it can see, not necessarily what it knows. If I can’t see that when I punch the pedal to the floor and zoom around cars that its giving me an ultra low MPG and costing me money, the only immediate effect left is the zoom sensation and the fact that I’m passing people. By adding a real time and an average MPG gauge to the console, I get an alternative source of immediate feedback and my mind can now work either game… zoom through traffic or get high MPG. Of course, on those days when I don’t feel like playing, I choose to drive the GTI for fun… or if I know I’m going on a long road trip up to Canada, I take the Insight because I know it will save me money. My commute on the other hand is, rather what I used to think was, a mindless task where gaming comes naturally. Yeah, I bought one, it’s called a ScanGauge II it was $179. It did change my driving habits on the freeway, but make sure you calibrate your speed with it as well as your tank otherwise it’s way off. Hey Nate 🙂 I found a couple options, including the ScanGauge II. There are some great fuel flow meters out there as well that accurately measure the fuel going into the engine. I know the ODBII data bus has a lot of data on it, especially for VWs (my GTI even has individual wheel RPMs) but I don’t know if there is an actual fuel flow meter built in to my car… or if there is one, how accurate it is. Many cars use throttle position and RPM to estimate fuel usage. Either way though, getting a meter might be a good way to slow me down 🙂 How responsive was the real time MPG meter for you? Can you set it up like the Insight where it’s a horizontal slider, or is it just a digital readout? The horizontal slider gauge is great because I don’t have to actually keep a direct eye on it to get a good sense of what’s going on. Using peripheral vision is essential when tailgaiting the big rigs!